Currently sitting at my parent’s house, back in my childhood home that is oddly the same but also different. The holidays are DEFINITELY my favorite time of year, my whole family flies back east to visit our extended family. Now some folks may think we are completely nuts, absurd and out of our mind to want to spend 3 weeks with our families, but we truly LOVE IT! Our kids love every second of it and it is all they have known since they have been little babies. We spend Christmas in Pennsylvania, DONE DEAL! It’s 3 weeks of uninterrupted time with my parents, my in-laws, my siblings and their kids, it’s pretty perfect. Now, don’t get me wrong, we have surely had our Griswold family drama over the years: fights, drama, tears…you name it! But in the end, those are the moments we remember. Those are the moments that make us stronger and closer to one another, I wouldn’t trade them for the world. Some of my favorite holiday moments from growing up are with my parents, brother, sister and our surrogate extended family. My godmother, my sister’s godmother and her daughter. They are the ones that we grew up with, we saw them as our aunts/grandparents. They gave us a glimmer of shine each holiday season. When they walked through the door on Christmas morning, THEY were the Santas, THEY did all the work, THEY made our days a little brighter. My parents worked extremely hard, but times were tough growing up and they did EVERYTHING for us, everything they could including putting food on the table. When the holidays came around, Lottie, Rosa and Marie took care of us while my parents took care of them. I think it was something that was just done and figured out, no one talked about it, no one asked, it just was the way it was. They were our Fairy Godmothers, literally! It was what family did. I treasure the memories with them, growing up by our sides. My godmother, Marie, passed away about 15 years ago. It was the first time someone close to me died. Each Christmas, in her honor, we have a secret Orr’s box that is passed to a new family member. See, Orr’s was a department store that she shopped at regularly over the years when we were kids. One day Orr’s closed the doors. But Marie was frugal, she saved lots of things: wrapping paper, stamps, tissue paper, ketchup packets, straws, you name it and she had it! So one Christmas (or Birthday), someone opened a gift and it happened to be in an Orr’s box (Orr’s by this point had been closed for many, many years). Of course we all found it amusing. Honestly, I’m not sure how it all began but now this Orr’s box is our precious passed family heirloom, yes, a box is our family heirloom because we are that crazy! These are things that make the holidays special and fun, sharing old memories, building new ones and bringing in new family members to celebrate all that is wonderful. 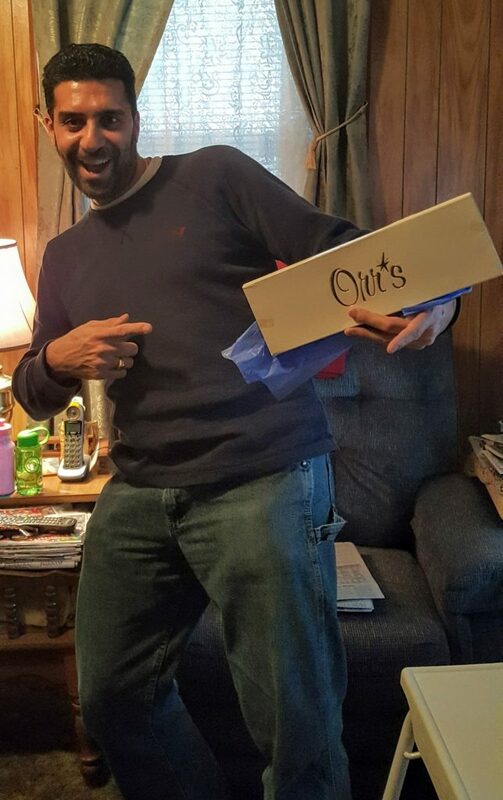 A photo of my brother, the 2016 recipient of the Orr’s Box. Note, this photo also is evidence of who has the box this year, AND this photo was taken on New Year’s Day because we had a box scare…but all is well and I have full hope that my brother will gift the box along. 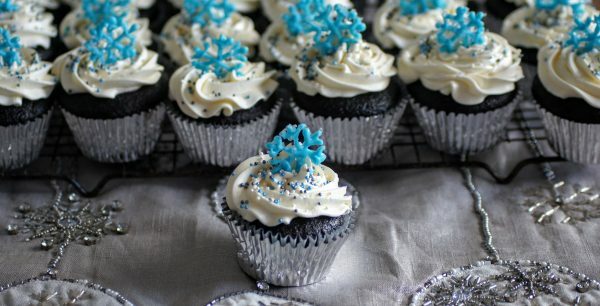 So now that you know a little about my crazy family, how about some holiday cupcakes??? You might need some after my story or if you’re spending time with YOUR family! I am hoping to make these with my nieces this coming weekend or at least have some made to decorate! I LOVE this recipe for cupcakes or a chocolate cake (that doesn’t need to be layered). It is so fluffy, moist and a perfect balance of chocolate. I hope you enjoy them as much as me! As always, I love seeing your creations, tag me on Instagram @CosettesKitchen or post on my Facebook Page. Preheat oven to 350 degrees Fahrenheit and line cupcake tins with cupcake liners. In bowl of stand mixer, combine sugar, flour, cocoa powder (sifted), baking powder, baking soda and salt. With paddle attachment, blend ingredients until combined. Slowly add in eggs and oil and mix for 2 minutes. Next, add in your milk and mix for another minute. Be sure to scrape down the sides of your mixer bowl. Finally, add in your hot coffee and vanilla until combined. Batter will be thin. Begin filling your cupcake tin with batter about 3/4 of the way full. Bake on the same rack, upper 1/3 of oven and bake for 18-22 minutes or until a tester comes out clean. 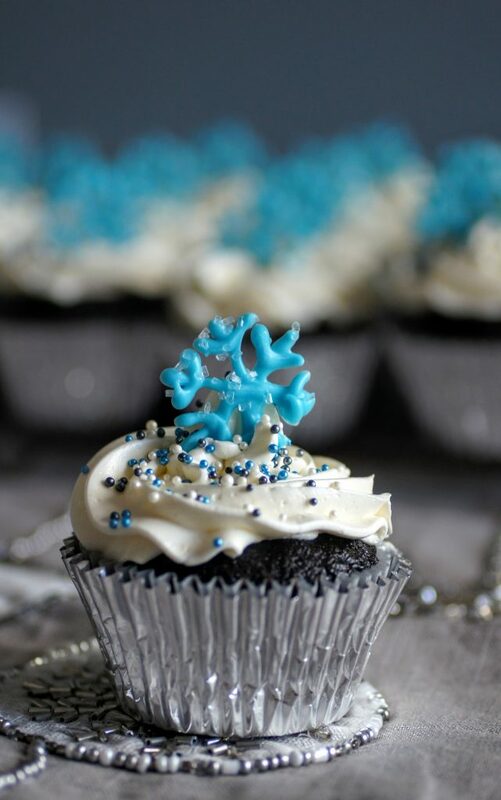 Frost with your favorite icing! *You can certainly use a whipped cream frosting or whatever you like. *For a 9x13 cake, grease and flour cake pan. Pour batter and bake for 30-35 minutes. Makes a delicious cake! *The snowflakes are made of chocolate. I printed a pattern I liked, melted candy melts, filled a piping bag and piped onto a wax paper with pattern underneath. Topped cupcakes when they hardened.